Thanks this is awesome data. I just hit 12 months as well. 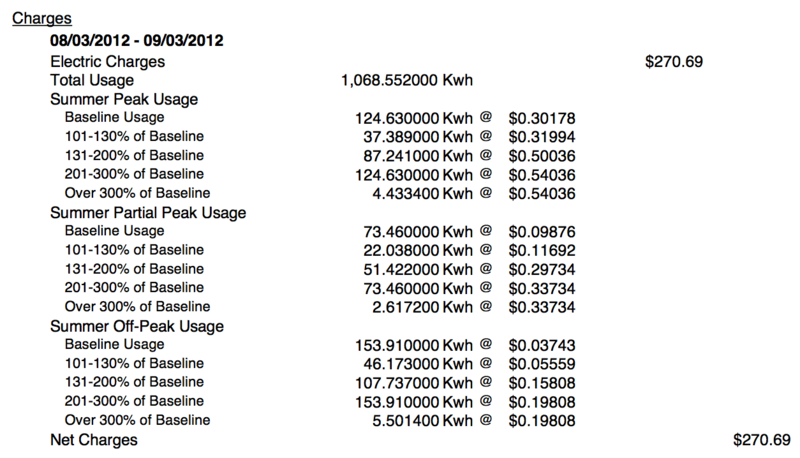 My Electricity rate is FIXED at $42.40 (with a separate meter from DTE). I can recharge 2 or 3x per day at no additional cost. I traded in a Chevy Impala (23MPG). What I find interesting is that fuel savings is NOT linear. If you can get your Volt to about 115MPG, you can save 80% of gasoline. Doubling the MPG to 230MPG will only save another 10%. 80% gasoline is good enough for me… if that means I can have 350+ miles of range whenever I need it. Was wondering if you could help me produce similar charts for my car. If you want to recreate the charts with your own data, you can start by clicking on the “Google Spreadsheet” link at the bottom of the post. From there, if you’re logged in to Google/Gmail, you should be able to select “File > Make a Copy…” and you’ll have a version of your own that you can edit. Then just change the gray values at the left, and the other numbers in blue, and everything else should recalculate. When you first bought the Volt, did you have to have a “plug” installed in your house for a couple of k? Does NDC have a plug there? I asked work if they’d install one if i purchased, but they said ‘no’, which was a factor in my deciding on a conventional hybrid. The first couple of weeks I charged using a regular 110V outlet in the garage, which worked fine (8h for a full charge). Except for one Saturday morning when Alisa turned on the hair dryer, which we discovered was on the same circuit, because the breaker tripped. So its best to have a dedicated circuit. I did have a 240V charger installed (completed a week or two after I bought the car). It was close to $0 cost to me. Equipment and most of the installation costs were covered by a DOE grant/incentive program. Judging by my experience, like most government funded programs, most of the dollars went to feeding a vast bureaucracy designed to “facilitate” installation. Now that its done, all is well. High quality and professional installation. About 4 hours for a full charge. A full charge gets me to and from work, so there’s no need to charge when I’m there. If I go beyond that for some work related reason, I sometimes drive around back, and plug in at the loading dock (regular 110V). An afternoon of 110V charging usually is sufficient to get back to Pleasanton on battery power. fyi – would not have seen the link without the Email. The Civic hybrid gets 41mpg during the winter & 38.5 during the summer. By contrast, the Sonata – now in the repair shop for a month after being re-ended while stationary in an exit lane! – only gets 34.5. The Civic was $24 out the door & then the federal government gave me $2k or $2500 (it’s been 5 years so i’ve forgotten) added to my tax return so that was an added incentive. Hey Craig, methinks I might have made a bad decision here.. I live in Emeryville and just signed up for the e9-A rate from the traditional e-1 rate. From your analysis and looking at your spreadsheet, it appears that the standard 12 cents per kwh makes more sense than moving to the tier, tou rates? Would you agree? I tried plugging in my numbers into your spreadsheet, but it didnt’ seem to be be summing correctly, probably wasn’t doing it correctly, but I’d be curious what the numbers would be? I seem to use the most electricity from 11-6am each day, since my wife and I like to sleep in a colder climate, so we run the AC. our typical monthly usage is around 700 kWh, but with the Volt, it’s jumped to 900 kWh, and I’m just got off the phone with PGE to move the rate to E-9a, which appears from all intensive purposes a red-herring. Any thoughts here from a guy who has data would be most appreciative.